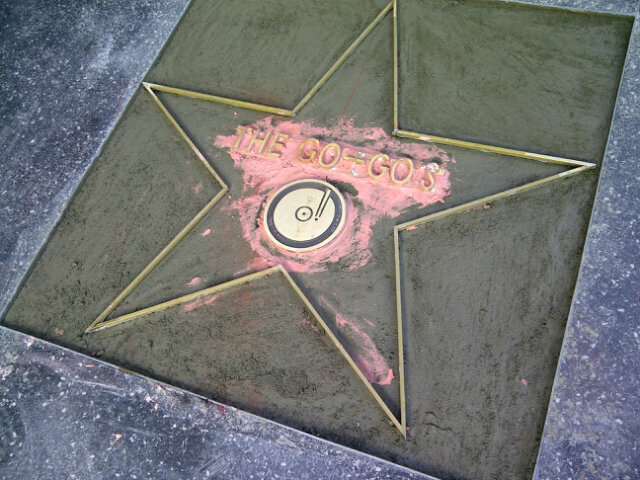 WAIST HIGH: Go-Go’s To Get Star On Hollywood Walk Of Fame. Go-Go’s To Get Star On Hollywood Walk Of Fame. The Go-Go's are set to receive the 2,444th Star on the Hollywood Walk of Fame in front of the Bettie Page Shop, formerly The Masque Nightclub where the band performed their very first show in 1978. The ceremony will take place Thursday, Aug. 11 at 11:30 a.m. The honor of the star coincides with the 30th anniversary of the Go-Go’s debut album Beauty and the Beat which went to #2 in the U.S. and was the first album to top the chart by an all-female band that wrote and performed its own songs. Beauty and the Beat was re-mastered and released in May by Capitol/I.R.S. and is available in a 2CD package and in two digital collections featuring the remastered original album plus previously unreleased concert recordings from 1981. From The Hollywood Chamber of Commerce: From their halcyon days as America's sweethearts to their current status as superstars who pioneered a genre, The Go-Go’s preside over an amazing three-decade reign as high pop priestesses. The internationally-loved pop hit makers helped cement the foundation of the early ‘80s pop-rock sound without the aid of outside composers, session players or, most importantly, creative compromise. From their very first show, the Go-Go's sang and played their own songs, offering five feisty role models for a generation of ready-to-rock girls and good, hooky fun for pop-loving guys.